Tara Asked : What is your monthly crafty budget? In all honesty I don’t have one. When I brainstorm ideas and need specific supplies , like the apples and acorns in my Back To School Sensory Tub I try to balance those out with crafts that I don’t have to buy anything for . Also when I brainstorm I open my horrifically messy art closet and look at supplies so I use what I have before running out to buy more of what I don’t. I try to do this for readers too, using the same supplies over and over for different activities so that if they have gone out and bought a more costly supply that they too will get a lot of use out of it. That doesn’t answer your question well though, if I had to estimate I would guess $20 a month, with some being $0 and others $35 or $40. Casey asked : Are you sending your son to public school, private school, or homeschooling? What factors influenced your decision? I will be sending my children to public school. To be frank it wasn’t a hard decision for me, I am a true believer in public education and while I support any parent’s desire and will to homeschool I have no personal desire to be my children’s teacher. We live in an area with good public schools and are planning a move to a district that we are even more impressed with our options. Both my husband and I had wonderful public educations and experiences going to public schools so that influenced us for sure. Deciding which route to go depends on so many factors and the individual child but at this point public is our plan. 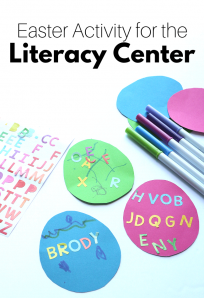 Allison asked : What are the best crafts and activities to keep a 2 year old entertained and help them learn colors, shapes and letters? Jennifer Asked: What do you do with your sons craft projects once completed? In general I recycle what I can and throw the rest out. I do take pictures of them and put them together into photo books though. However this year was the first year that he went to preschool and I save all of that and made a scrap book with big binder rings and heavy weight construction paper. I can’t take credit for that though , that was a planned project at a parent night for his school. For those of you looking to limit what your child asks to display a suggestion I have is to have a display area ( fridge, clothes line, frame) and simply make a one in one out rule. If you are looking to keep everything the giant ziploc bags are great, you can throw everything in there and pop it under a bed, or even in a garage, as long as it’s sealed things won’t get damp. Jennifer Asked : What type of activity is the most important ( besides reading) for a one year old? 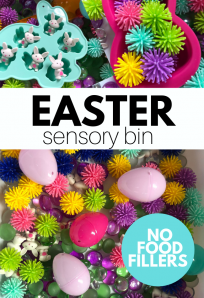 Personally I think that sensory activities are the most important if I had to choose just one. At 12-24 months children are exploring their world through their senses in ways that we simply do not. It’s important we provide them with all different experiences to taste, touch, smell, hear and see. I would stay clear of structured crafts in general at this age , focusing on open ended experiences that are focused only on the process. Don’t forget to talk to them while playing, so often caregivers are quiet and really it should be the opposite. 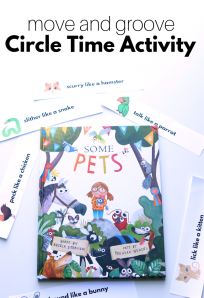 Narrate as you explore , label items you are using, colors, letters and speak for them too . Language development is a huge part of this age group and if you don’t talk to them how will they learn? She also asked : How much time should be spent reading for older children? I wouldn’t make a minimum time so much as find a way to fit reading into your daily schedule in at least two places. The reason I say 2 is because if your schedule is disrupted you will likely still manage to hit one of the two reading times even with a disruption. In our house we read at nap time and bedtime ( on no nap days we read at lunch or bath time) and randomly in between as well. 3 books minimum at each. For an older child who is reading on their own you can make a time requirement during these times , I would double their age for minutes at each reading time ( 12 minutes for a 6 year old, 20 for a 10 year old etc…) that is the minimum. Thanks for your questions , if i didn’t get to yours I will pop it in the next Readers Q&A ! So glad Allison asked about two year olds!!! Can’t wait to try those fun activities with my son. Thanks for sharing! .-= mamahall´s last blog ..menu planning monday- summer tortellini and more =-. Good questions and great answers. Thank you for sharing. You are so inspiring and such a great person. .-= Kim´s last blog ..What do you do when your kids are sick =-. Oh and pic of the picture album would be great! DO you guys mean the scrapbook or the photo book?